Psychology major Shanquel Askew, president of Black Student Unification, is preparing for a career helping youth in the juvenile justice system. High School: "I attended Westside High School and was a member of yearbook, book, and theater clubs and the prom committee. Family: Jansene White (mother), Mr. and Mrs. Curry (godparents). Employment: MGA Library work study. Degree Objective: Bachelor of Science in Psychology with a concertation in pre-clinical and counseling. Activities: "I am the president of Black Student Unification, a member of the Campus Activity Board and an Experiential Learning participant." Career Goals: "I want to work with at-risk youth in the juvenile justice system." 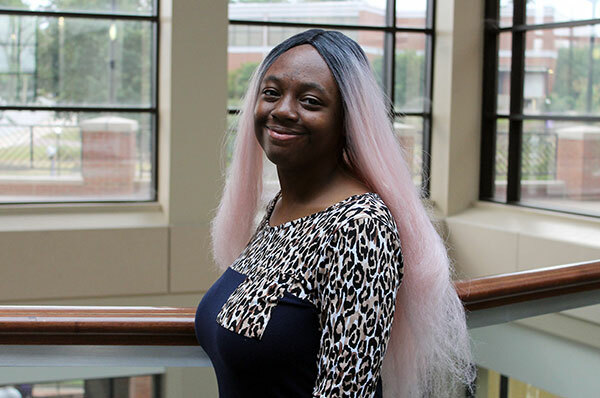 She chose Middle Georgia State University because of … "It's affordable and the University has ample opportunities for students to help them succeed academically and personally." The greatest thing she discovered about Middle Georgia State was … "Knights Impact, an international service learning program. In the spring of 2017, I was able to spend a week in the Dominican Republic. It was my first time leaving the United States and traveling on a ship. We helped the locals with service projects related to economic opportunity, health, and wellness. I also participated in Knights Impact in spring 2018, when we went to the eastern Caribbean. I have gained a global perspective." Her greatest academic experience as a Middle Georgia State student has been … "A great course called 'Introduction to the Psychology of Superheroes.' There were major topics in the course related to superheroes in film and graphic novels such Batman, Black Panther, the Scarecrow and much more. I loved how the professor integrated superheroes into the course to teach us different topics in psychology. It helped me get a grasp of the concepts of psychology. I fell in love with psychology even more." To her, greatness means … "To keep pushing whenever roadblocks come up. Roadblocks will take where you are weak and strengthen you. Greatness also means exploring options that are out there. Everyone is destined for greatness." In five years … "I will go to graduate school to get a master's in social work. Once I have earned my master's degree, I see myself working in the juvenile justice system."